The Digitech RP500 Integrated Effect Switching System is a comprehensive guitar workstation that features advanced modeling capabilities and a massive effects library modeled on some of the most popular effects in recorded music's history. The RP500 starts by modeling 50 classic amps and 25 cabinets that you can mix and match. An extensive library of 125 effects can be applied individually, or as part of one of 30 preset effects chains. Any three effect parameters can be applied to the expression pedal, for combined effect shifts that are truly innovative. The USB connection can be used for computer editing of presets. But it can also be used for audio streaming (two streams up, two streams down), making the RP500 an excellent choice for direct computer recording. The integrated tuner makes it easy to get in tune while the extensive inputs and outputs, switchable modeling (you can turn it off for live play through an amp), and high-resolution 24-bit sound make the RP350 a comprehensive guitar workstation that travels easily between practice, rehearsal, recording, and performance. 50 amps and 25 cabinets are modeled in 24-bit sound. Digitech's Component Modeling gives a more dynamic, responsive depiction of an amp's performance than amp modeling alone. An elaborate set of 125 effects cover the gamut of what a guitarist could possibly need. You can tweak them by hand, or apply them as one of 30 effect chain presets that help you get the most out of combined effects. 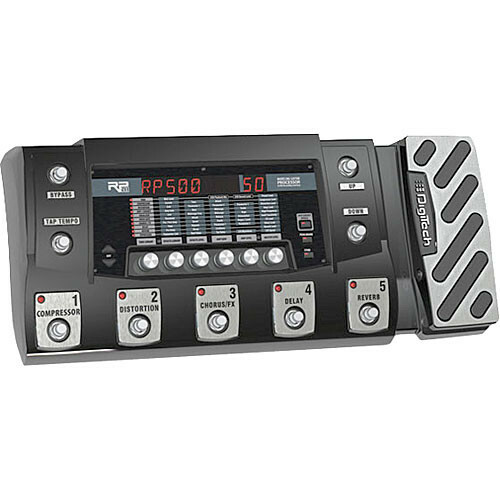 The RP500's expression pedal can be loaded with up to three effect parameters. Almost every parameter is available to be assigned. You could, as one example, increase the reverb, chorus depth, and distortion as you depress the pedal. The 100 factory presets are matched by 100 user memory locations, so you can save your own creations without losing the excellent preset sounds. The USB connection in the back is not just for computer editing of presets. It also facilitates 2-way audio streaming (2 streams up, 2 streams down), making the RP500 an excellent all-in-one interface for direct computer recording. Box Dimensions (LxWxH) 24.0 x 12.1 x 4.7"
RP500 Integrated Effect Switching System is rated 5.0 out of 5 by 1. Rated 5 out of 5 by Anonymous from Overwhelmed newby I'm pretty new to playing electric, but decided to get this rather than picking up an effect pedal here and there for a whole lot more money in aggregate. After just a couple hours fooling with it, I was overwhelmed. It's hard to imagine needing something in the way of effects that this system can't do. I'm sure if you're in a serious band you'd probably need some other bells and whistles (like the amp loop that this one doesn't have), but I can't see that I'll ever need anything else. I've been using it at church as well, and it sounds awesome over the sound system. The dual outputs - XLR and 1/4-inch, both stereo - have been a really nice feature as well, allowing us to hook up to the sound board and simultaneously to an amp without any additional stuff. One note - a number of the sites selling this item, and even the DigiTech website says it has a 20-second looper on it. Best I've been able to tell, it doesn't. (It's not mentioned in the owner's manual.) This was no big deal for me since I have a JamMan already, but someone wanting that feature needs to look to the RP1000 or another piece of equipment like the JamMan.